The Venerable Bede, born cAD673, died cAD735, wrote a surprisingly cosmopolitan book for that era, entitled “Ecclesiastical History of the English People.1” Its readers knew that this was a work full of data from the outset. Why did the Venerable Bede consider Ireland so geographically enlarged? The Venerable Bede was a monk within the monastic establishment of Jarrow. From his writings we are able to establish that he had an intellect which enabled him to master many subjects, as well as being a talented and descriptive writer. The fact that he was one of c600 monks in the two co-joint monasteries of Wearmouth and Jarrow around AD716, and, although Jarrow was the smaller with probably less than 200 monks, it still points to a persona capable of rising above the norm. It is to his credit that his treatises were copied by other monks for despatch to Europe-wide monastic establishments. Because of those many original copies we still have four eighth century manuscripts of his History surviving. It is fortuitous that Bede was accepted at the tender age of seven years by the Abbot of Wearmouth, Benedict Biscop. For here we have a clue to the data Bede found available. Benedict Biscop, c628-689, twice visited Rome in his early years, and after his third visit c671-672, returned to his native Northumbria and founded the monastery at Wearmouth. These original trips, plus another in 676-680, resulted in a myriad of books, paintings and relics of the saints being transferred to Northumbria. In 681, Biscop founded a twin monastery at Jarrow and afterwards made a last trip to Rome during the years 685-686, to acquire even more books and paintings. Thus the Venerable Bede, by extra-ordinary fortuitousness was accepted into co-joint monasteries which by the end of the 7th century were probably the bibliotheque of England. It is thus that the works of the great Greek and Roman authors, as well as documents by British authors such as the Priest Gildas, cAD500 were available. Indeed Bede relates how a copy of Cosmographiorum codici mirandi operis4 or “a manuscript of the cosmographers” was exchanged for land in about AD 690. The quotations referenced 2), and 3), taken from Bede’s text are descriptions of Ireland. Our scribe has collated information from many sources, but, even though he is an educated person, he has never left Jarrow. The world has come to him. Thus the comment regarding Ireland extending far beyond the south of Britain towards the coast of Spain is most likely to be the result of information from another source, and one who had either a strange map or maps, and little knowledge of geography. Quite obviously the missing portion of PEUTINGER is not a prime contender for this strange map. he must have acquired the most compelling information. 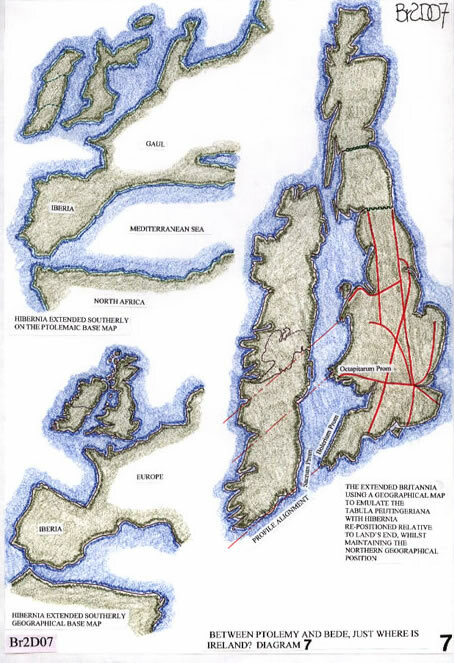 As has been discussed it was not the Tabula Peutingeriana, but could have been a partial copy, possibly even an original Roman map of Britannia and Ireland. Even scribal error in transcription, a misreading of the originals, or other such errors entering the documents over some four centuries is a possibility. Whatever it was the Venerable Bede believed its veracity! The illustration, Br2D01, is an attempt to reconstruct the shape of Britannia using information thought to be available at the end of the Roman occupation5, and likely to have been copied in the first Scriptoria. It is not a geographical map, but a diagram, elongating the proportion of Britannia from c2:1 to c4:1, as per Bede’s statement. The 4:1 proportion being that required to represent the Island by virtue of layout and paper size, the proportions of the drawn T.P. 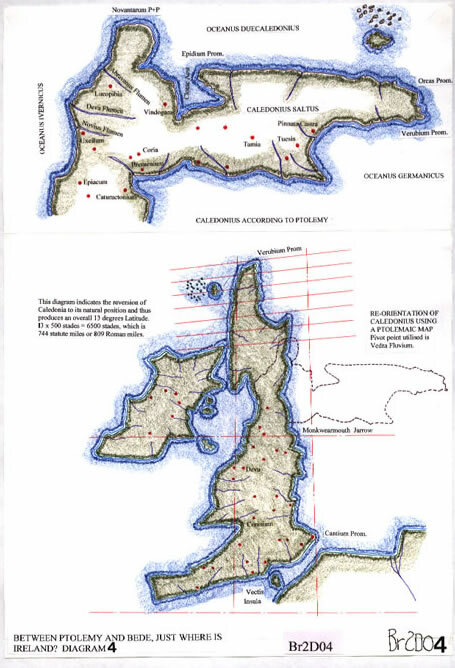 This reconstruction utilises the original Segmentum II base, and illustrates how one important feature has been omitted, the Belerion Promontory of Cornwall and St. Michael’s Mount, Lands End. From cAD400, this was probably the trading station of ICTIS, an important economic focus for west Cornwall and no doubt used in the Roman period also. But in c400-600 it is possible that an early citadel similar to Tintagel, as well as an early Christian centre with both St. Keyne and St. Cadoc visiting, was situated here. Therefore it would be somewhat surprising that, if by the 8th century this peninsula was not well known to Bede, considering there were then monasteries at St. Germans, St. Kew, Southill and Tintagel, plus the Bishop’s Seat at Bodmin and a chapel, St. Constantinus at St. Merryn. This peninsula is surely one of Bede’s “number of promontories”, which the OS map names as “Antivestaeum sive Belerium Prom.” for Lands End, and for the Lizard Point, “Dumnonium sive Ocrinum Prom.” It is, in academic circles thought doubtful, but, if a copy of Claudius Ptolemy’s6 maps were available, the peninsula that is Cornwall could not have been missed, it dominates the map, and Ireland is plotted in context. But why is it doubtful that copies or even a copy of a copy of a copy of Ptolemy’s map arrived in Britannia by the end of the 7th century, some 500 years after the original was drawn? The Abbot Benedict Biscop was not alone in scouring Europe for books to send back to monasteries in Britannia. There appears to have been a veritable flood of books collected by the various well travelled monks and bishops. The fact that many only survived a short period does not mean they were not studied. Unfortunately not one map actually prepared by Claudius Ptolemy6 exists. Each and every edition of Ptolemy’s Cosmographia/Geographia6a are reproduced by others; from Al-Idrisi [1075-c1165], Planudes [c1260-c1310], Jacopo d’Angelo and the monk Nicholas Germanus [in 1406 and 1466] to the first printed Ptolemaic Atlas, published at Bologna in 1477, they are all reworked/redrawn. 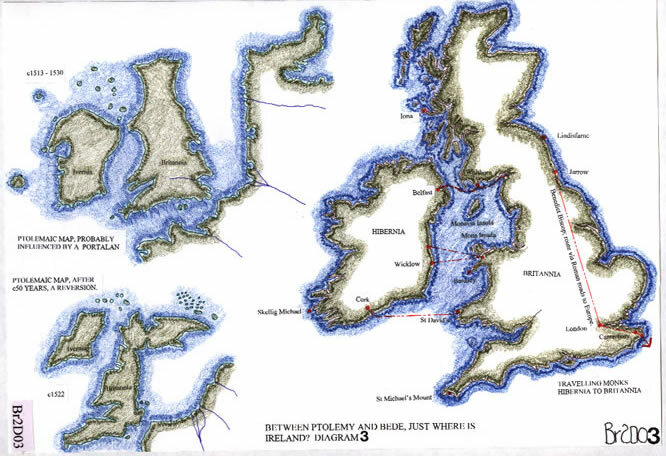 But, through these redraws we can see the changing shape of Britannia and Hibernia. There is no definitive shape evident and thus a distinct lack of reality for the form when compared to the OS map. But it is this unreal portrayal of the shape that in all probability underpins the statements by the Venerable Bede. Thus they were the accepted shape of Britannia. Ptolemy’s guestimate for the length of Britannia utilizes 10 degrees of latitude, or, c5000 Stades, from Land’s End to his northerly point, the Rhinns of Galloway, Novantarum Prom. That is calculated from a circumference of 180,000 Stades, or 500 Stades per degree of latitude. The Greek Stade can be c200, c220 or c236 yards, and thus for a theoretical evaluation we can utilize the Stadion of c202 yards or c184 metres. During this period monks were travelling the northern roads of Britannia, to the Orkney and Shetland Isles, and even to the Faroe’s and Iceland [see Dicuil note]. They must have known, and noted, that they were basically travelling north, and not east/west, as Ptolemy would have them believe. The sun in your eyes or to your right hand side cannot be mistaken for the sunrise on your right hand and on the back of your neck during the day! The text Br1 argues that the monks probably saw a copy of Ptolemy’s map of Britannia, corrected its form by pivoting Scotland back to its northerly aspect and thus produced a length for Britannia of 800 miles as stated by Gildas in c500CE. Could the Venerable Bede have produced, or have seen this map as altered? 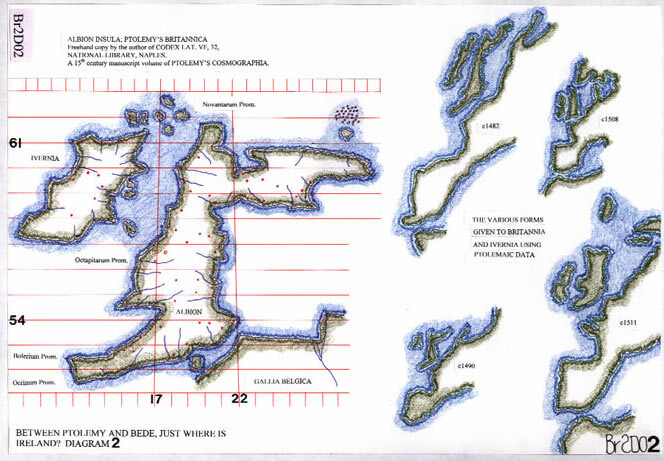 The pivot point for the re-orientation of Ptolemy’s map is the apparent internal angle which just happens to be the Vedra Fluvius or River Wear, at the mouth of which are situated the co-joint Monasteries of Wearmouth and Jarrow. This was Bede’s home for some 55 years! He did not look at Caledonia in the East; there would have been nothing but ocean there. It is therefore inconceivable that, if and when a copy of Ptolemy’s map, or, one of a similar format arrived in these monasteries, that the error would not have been corrected before copies were made. These were not Monks who were un-educated, who did not observe and record, they were scholars. The fact that the Romans did not invade Hibernia has given researchers a marvellous opportunity to compare history and mythology etc, etc, developing out with such an enormous influence. However, it also means that the island of Hiberniawas not the subject of an official survey, measurements, land divisions or road alignments, on a much regimented basis. Therefore any representation of its shape, size and position on the globe would be estimated, possibly by its relative position to a known survey, Britannia. But, surveyors were available to Claudius Ptolemy, the Roman Agrimensors or Geometers of the Roman Army10. Therefore, by the 2nd century AD it appears likely that the Classis Britannica sailed around Hibernia and recorded its form and took latitudinal readings. Or it is perhaps the work of [?Scribonius] Demetrius ‘grammaticus’ of Tarsus, [a schoolmaster], who at the end of the first century AD was seconded to an expedition, and given instructions to carry out a geographical survey of the northern areas of Britannia and particularly what is now Scotland. What we do know about Hibernia is that there was a lively trade7 between the Celts and the Romano-British until the 4th century; British Christianity influenced Hibernia considerably, and the Irish8 themselves became expansionists moving to the west coast of England and Scotland. There were monasteries, and with the trade there were sea voyages from Cork in the south and Rathlin Island in the north. These voyages in the simplest of terms were due east, due west return. Would a monk on such a voyage have been unaware of the true sailing direction? He most certainly would have been aware of the timescale of the voyage, considering the monastic necessity to maintain the Holy Orders of Prayer, by being aware of the Sun’s position during the day to regulate the cycle correctly. A monk would surely have known if he was sailing east/west, north east/south west etc, etc. The situation of Hibernia in the seas west of Britannia should have been known reasonably accurately. That it was not, questions the veracity of Bede’s data. The limits of Ireland can be described as from Latitude 51.5N to 55.25N and 5.5W to 10.5W longitude. Using the Ptolemaic method, the ratio of latitude to longitude is a very credible 3:5, 0.6 cosine, and c53N centre. This is the same ratio that can be shown was utilised in Britannia by the Roman Agrimensors based upon an assessment of their survey planning works (see Ferrar/Richardson11). Thus Ireland is basically a rectangle 240KM wide and 400Km north/south. But Ireland can be delimited by reference to the British coastline, such that it extends from EPIDIUM PROM [Mull of Kintyre] in the north, to OCTAPITURUM PROM [St. David’s Head], in the south. Its location adjacent to Britannia is such that from EPIDURUM PROM to ROBOGDIUM PROM [Fair head], Ireland is c22Km [c14M], and as such, at only two thirds of the Dover Straits distance, highly visible. What is now known as the North Channel where NOVANTARUM PROM [Rhinns of Galloway] faces Ireland, it is only c35Km or c22M, as is the Strait of Dover. With this high visibility locating the north of Ireland we must surely accept that the northern extent was well known and a fixed location apropos Britannia. But, we cannot argue by similar points for the southern extent of Ireland. From extant evidence it is not possible to reconcile the statements by Bede regarding the shape of Britannia, nor the situation of Ireland occupying more southerly latitudes. 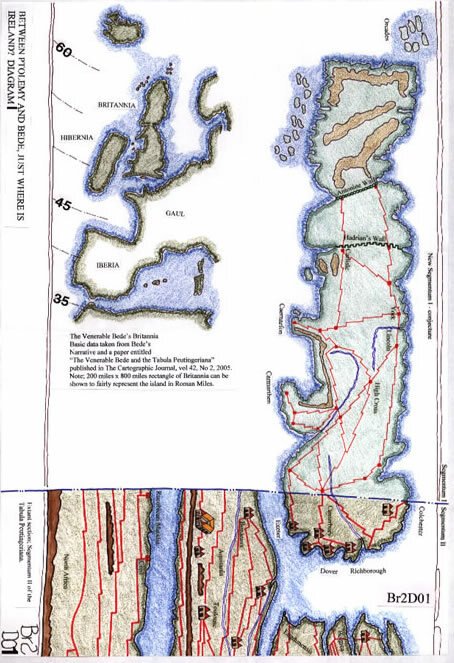 However, it is possible, as has been shown within the papers Tp1 and Br1, to reconstruct one of the maps or diagrams which may have been available for study. Plainly though, as already explained Ireland’s situation is an enigma. But, on reading Bede’s text with his explicit references to ‘promontories’, we can be certain that Bede knew of them and considered them important. The monasteries of Wearmouth and Jarrow are on what may be described as the flattest section of coastline on an island of promontories, and thus they are not mentioned because of prior or local knowledge. It is therefore the contention of this paper that Bede or his informants had a map or maps, probably based upon a development of The Tabula Peutingeriana, a probable Roman map/diagram of the 4th century, which was copied, and then amended by a coalescence with smaller less satisfactory, but possibly more geographically accurate Roman maps. An example is indicated upon diagram Br2D06, whereby the length of Britannia, and hence Hibernia for context, has been extended by means of simply doubling the latitudinal scale whilst maintaining the normal longitudinal scale. The comparison can then be made to the speculative Tabula Peutingeriana map, and it thus shows, and is quite evident it could be used for either the T.P. or Bede’s map. A scribe or scribes endeavoured to rationalise the irreconcilable, and then with the resultant map being copied many times during the intervening centuries, that scribal error, by the end of the 7th century had probably confused the Cornish BELERION PROM with its uncannily similar format to the OCTAPITARUM PROM of St. David’s Head, Pembrokeshire, and the original alignment to GANGANORUM PROM, the Lleyn Peninsula. 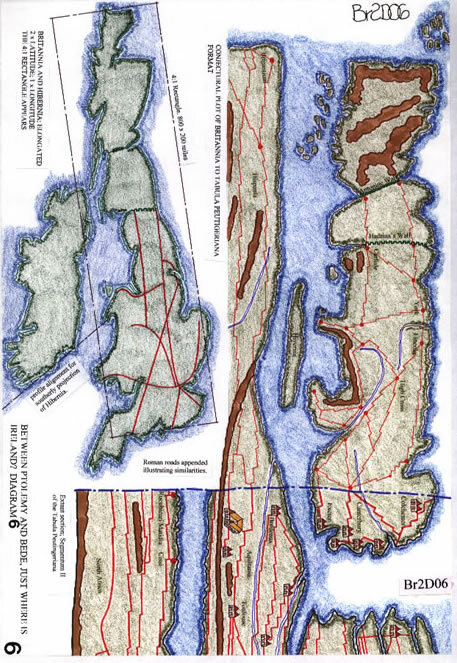 Shown on diagram Br2D06, the speculative Tabula Peutingeriana is juxtaposed with the elongated Britannia, and there is an uncanny resemblance between the two. The promontories have been noted as contenders for the geographical forms which could have led to the putative scribal errors described. 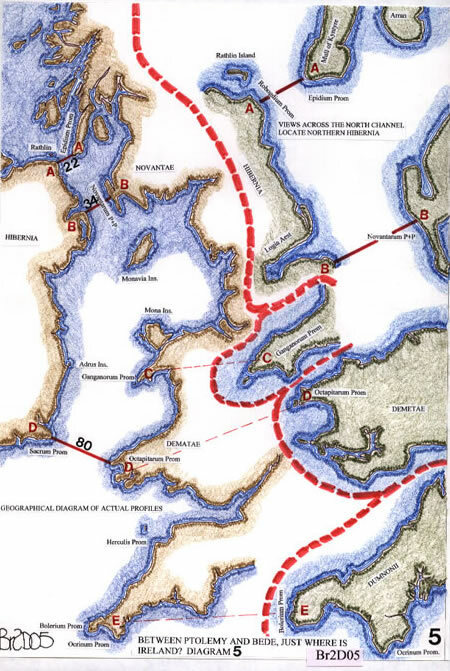 Thus if we actually use our elongated Britannia, the situation of Ireland as described by Bede, can be shown relative to either the Octapitarum Prom of St. David’s Head or the Belerion Prom of Land’s End as Br2D07 illustrates. By maintaining the angular alignment of the south coast of Ireland relative to Britannia and the Lleyn Peninsula, the new southernmost alignment to be set against Land’s End, can be plotted. The effect in visual terms upon the map of Europe and particularly the relationship to the coast of the Iberian Peninsula is striking indeed. It encapsulates all of the Venerable Bede’s statements regarding the form of Britannia and the position of Ireland. A monastery, perhaps that of the Venerable Bede, received a copy of Claudius Ptolemy or a similar map4 which required adjustment to correct an original error in the positioning of Caledonia. That adjustment reflected the extant proportions of the Tabula Peutingeriana, which indicated the routes described in the Itinerarium Antonini. Thus there was a coalescence of misinformation when all texts appeared to confirm each other and led to both Gildas and the Venerable Bede’s classic mis-statements regarding the ratio size of Britannia and the location of Ireland. It does however indicate that contrary to popular belief, there may have been maps available through the Roman period and through what we loosely term the Dark Ages. Extracts from “A History of Christianity”, Paul Johnson, 1976, published by Weidenfeld and Nicolson; Part Two, “From Martyrs to Inquisitors [AD 250-450].and Part Three, ”Mitred Lords and Crowned Ikons” [450-1054], pages 153-160. During the seventh and throughout the eighth centuries, the Scriptoria reached a high stage of activity, especially at Canterbury, Ripon, Wearmouth, Jarrow, York and Lindisfarne in England; at Bangor, Burrow and Kells in Ireland; at Autun, Luxeuil, Corbie, St. Medard-de-Soissons in Gaul, and, further east and south, at Echtenach, St. Gall, Bobbio and Noantola.——- We hear of libraries which contained thirty three, eighteen, fifty volumes, and so on. In the eighth century a library with a hundred books was outstanding. But they grew steadily: by the ninth century the library of St. Remy at Reims, enjoying royal patronage had six hundred volumes. And many of these books were made to last. A small seventh century St. John’s Gospel, from Wearmouth or Jarrow, which was once probably Bede’s own copy and is now at Stonyhurst, survives in superb condition in its original binding of red African goatskin.———-Hence, in the eighth and ninth centuries virtually all the ancient texts were re-copied, often many times, and so saved.———- vital texts of Tacitus, Seutonius, Ammianus, Vetruvius and Servius, through whom medieval men learnt their Virgil. Thus the British Isles were able to play a part out of all proportion to their economic or population resources. Ireland began “exporting” scholars to the continent [as well as to Britain] at a very early stage. It was an Irishman, DICUIL, perhaps an Iona monk, who produced the earliest geographical survey written on Frankish territory, the LIBER DE MENSURA ORBIS TERRAE, which included a description of the elephant sent to Charlemagne in 804 by Harun-al Rashid, and notes on Iceland and the Faroe’s, which DICUIL seems to have visited. It should also be noted that most monasteries and ecclesiastical establishments recorded their land holdings via a Polyptyque. This was an ecclesiastical land survey or inventory of their holdings and included descriptions of the estates within the domain and out with it; it included lists of goods available as well as the labour force available to work the land efficiently. 4, Bede, Vita sanctorum abbatum monasterii , [Lives of the Abbots] in Bede, Historical Works, Harvard University Press, 1930. 5, Frere Sheppard, Britannia, Routledge and Kegan Paul Ltd. 1967, 1974. 1990, English Edition, Magna Books Leicester. 6a, Stevenson, Edward Luther, Claudius Ptolemy, The Geography, New York, 1932, 1991. 7, Bowen E G, Britain and the Western Seaways, Thames and Hudson 1972. 8, Thomas Charles, Britain and Ireland in early Christian Times, AD400-800. T &H, 1971. 9, Johnson Paul, A History of Christianity, Weidenfeld and Nicholson, 1976. 10, Dilke O A W, The Roman Land Surveyors, Newton Abbot 1971. Delano-Smith C, & Kain R J P, “English Maps A History”, The British Library London, 1999.